Have you ever tried squid ink? I’d venture that many of our readers, Italian food lovers that you are, haven’t, but it’s really getting to know. Squid ink has a unique “earthy” flavor, silky mouth feel and alluring jet black color that couples perfectly with pasta. I find it irresistible. The recipe for spaghetti al nero di seppia is really simple: You begin much as if you were making a basic aglio, olio e peperoncino, then add finely chopped up squid and let it braise with a splash of white wine until tender. Then in goes the squid ink to simmer for a minute or two and work its magic. This intensely savory sauce goes beautifully with spaghetti or any other long pasta such as linguine or even tagliatelle. And if you’re in Venice, bigoli would be a classic choice. I’d really encourage you to give spaghetti al nero di seppia a try. Somehow both elegant and rustic at the same time, it’s a dish equally at home at a dinner party or the family dinner table. Add the cut up squid, give it a good stir to cover it with the seasoned oil. Let the squid sweat in the oil, uncovered, for a few minutes. Add a splash of white wine and cover, letting the squid simmer very gently for another 15 minutes or so, or until tender. When the squid is done, add the squid ink (along with drizzle of water if needed to keep things saucy) and continue simmering until the resulting sauce is thick and very black. Shortly before the sauce is done cooking, boil the spaghetti in well salted water until al dente. Add the cooked pasta, drained but not too well, to the pan and mix well so the pasta is well coated with the jet black sauce. Serve immediately. Traditional Italian recipes assume that you’re buying uncleaned squid with the ink sac—which all squid naturally have—still attached. You just save the sac while you’re cleaning the squid and add the ink in it to the saucepan when the time comes. Here in the US at least, squid is invariably sold already cleaned, with the ink sac removed. But fortunately, you can buy little sachets of squid ink separately. Our local Spanish deli carries them, and you can also buy them online. If you find you really love the stuff, you can also buy whole jars as well. Spaghetti al nero di seppia has few complications, but some pointers might still be in order, beginning with a gentle word of caution. There’s a reason they call it squid ink. It really does stain! So do be careful as you squeeze the ink out of its sachet and into the pan. Inevitably you’ll get your fingers stained, but it will wash out easily with water. Not sure the same could be said if you get it on your clothes. And, by the way, squid ink is perishable, so keep it in the fridge and, if you won’t be using it within a day or so, in the freezer. The small sachets defrost almost instantly. You need to cut up your squid into very small pieces. Cut the head or “mantle” (and fins, if they haven’t been trimmed off) into small dice or thin strips, and the tentacles into short lengths. This will not only help the squid cook more quickly, but otherwise big chunks of squid on top of your spaghetti make for awkward eating. Even if your squid are cleaned, do check for the “beak”—the hard ring at the base on the tentacles—and remove it if it hasn’t been trimmed. Cooking times for squid vary by size and age, as well as technique. There are basically two ways to cook squid. First, very quickly using intense, dry heat, as you would for grilled or fried calamari. Second, as in this dish, braised for a relatively long time, until tender. Small or baby squid—which to my mind are best for this dish—can take as little as 15 minutes to reach tenderness, but older, larger squid can take upwards of 45 minutes. The measurements for this dish are pretty open ended. The amount of squid is usually a bit more by weight than the pasta, but some recipes call for as much as a 2:1 ratio. (NB: The squid does reduce quite a bit in cooking.) Similarly, you can vary the amount of squid ink. Personally, I like using one 3g sachet per serving, but you can certainly add more if you really like the taste. And if you like, you can make a ‘red’ version of the sauce. Add a bit of tomato passata or tomato paste to braise along with the squid. It won’t change the color much (or at all) but it will add a hint of added savor. Or if you want the tomato to really stand out, use cherry or grape tomatoes, cut in half, about 5-10 minutes before you reckon the sauce will be done. And, by the way, if you do enjoy the spaghetti with squid ink, do try squid ink risotto, which we featured some time ago. It’s just as delicious. When the squid is done, add the squid ink (along with a drizzle of water if needed to keep things saucy) and continue simmering until the resulting sauce is thick and very black. ah Frank, this is such a wonderful pasta, one that reminds me of the holidays of my youth in Sicily and especially of the visits to the Aeolian islands. Thank you for warming up a rainy winter day! So glad I could bring back those childhood memories, Letizia. Those holidays sound absolutely idyllic. How interesting, I always assumed that the squid ink would be kneaded into the pasta dough, I had no idea it was a simple stain! I do love squid so this dish would be right up my alley. Perhaps I will venture to make it for an appetizer for our next dinner party. It is really striking! They do make pasta with the ink kneaded into it, too, but I actually like this better. You can really taste the squid ink. Worth a try! Seafood… squid… and pasta. What a surprising combination. The cooking directions are easy to follow. This is a must try dish at home! What a helpful post, Frank! I must admit that I’ve never cooked with squid ink. However, Laura and I did pick up some squid ink pasta when we were in Florence last year. We haven’t gotten around to using it yet, so this post is a good reminder for that. And if we like that one, then we’ll have to look into getting some actual squid ink. Sounds like a fun weekend cooking project if you ask me! Thanks, David! It is actually kind of fun getting your hands dirty and seeing how the ink turns the off-white pasta pitch black in just moments. I’ve had this in restaurants, and squid ink risotto too, but I’ve never made anything with it myself. This recipe sounds delicious, and I love your description of how silky smooth the texture is. Thanks so much, Valentina. I do think that texture is one of the delights of this dish. Well, as you know, I love my squid ink! Tried to buy small sachets in Sicily but they weren’t to be found. Just jars that were too big to carry on the plane! (Yes, we did three weeks with only tiny carry on bags!) I’ve made the actual pasta using squid ink, and have had risotto similar to what you prepared, so now it’s time to make this pasta! The first time I tasted this dish was in Venice but I’ve never prepared it myself. Your spaghetti al nero di seppie looks fantastic and sounds wonderfully tasty. I’ve had the dish once or twice, but never made it myself. I must go on a search for the sachets of squid ink as I’d like to make this one. Thanks for a great recipe, Frank. *big smile* this was the primo piatti for my second wedding breakfast – a long way back and methinks it got to a few of what really was a ‘foodie’ contingent. Am more than pleased that I can still get fresh squid ink and use it once or twice a month when friends ask . . . . delightful . . . I think this would be a wonderful if unusual wedding dish, although I wouldn’t dare try such a thing here in the States. It would be too “controversial”… Nice that you have ready access to squid ink, it’s a rarity in these parts. What a great looking dish, where to you get the sachets of squid ink? 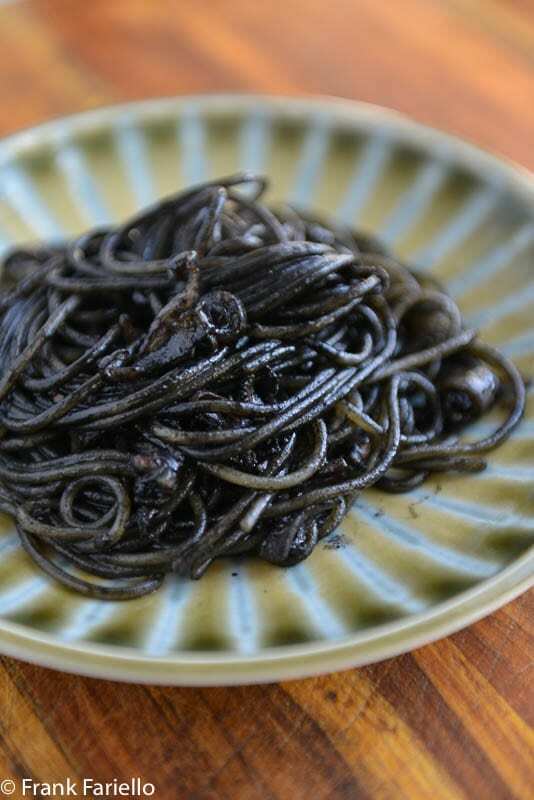 I’ve never used squid ink, but I have used “black” pasta (which of course has squid ink as an ingredient). Anyway, terrific post — loved this. Thanks. If you like black pasta, I think you’d love this. The taste of the squid ink is much more pronounced when it’s in a sauce rather than in the pasta! I could just imagine the crime scene… 😂 That cuttlefish recipe sounds fantastic. I did something not too different some time back. I’ve never had pasta with squid ink, but other dishes. In fact, I had a lovely risotto dish at Harry’s Bar in Venice last June. This pasta looks quite exotic, and I’m sure I’d love it, too! I’m sure you would. And the risotto is lovely, too.